I had a long day of exploring, commuting, and getting errands done. It was also an unseasonably warm day outside which in food translated into a light meal. My local farmer’s market has a salmon gal and I picked up a pair of sockeye burgers from her. They’re all salmon and no filler. I defrosted those puppies today and fried them up. Meanwhile, it was also an opportunity to practice making an accompanying sauce. I underestimate the power of a great sauce to liven up a dish and really pull everything together. I also have an opportunity to amp up my sauce making skills. When I first start cooking dinners, I would focus on a protein, a carb and a vegetable. Making three coordinated dishes was enough work and mental ju jitsu. Then I added a dessert to the meal. Now I was to polish the meal and also create a sauce to tie the dish together. The sauce I made tonight I would call cheating a bit since its base is organic, jarred mayo, but everything else is freshly mixed. The aioli has basil, Meyer lemon juice, fresh garlic, mustard powder, black pepper and salt. It was so refreshing! I based the ingredients on this recipe idea. For future me trying to recreate it, I used about a tablespoon of mayo, one cube of frozen basil, a teaspoon of lemon juice, a pinch of fresh garlic, a pinch of fresh ground pepper, and salt to taste. Yum! 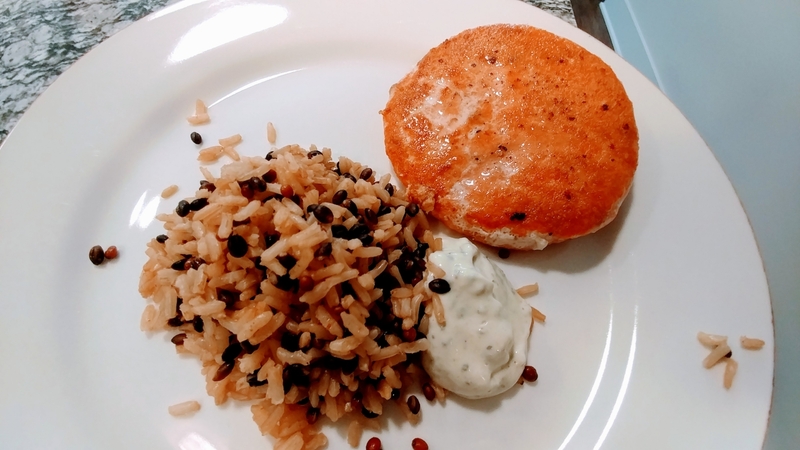 The aioli was SO good with the salmon burger and brown rice medley. Felt like such a nutritious meal…maybe minus the mayo-based sauce!